I am so excited to share with you some goodies from Oriental Trading Company and some ways to use them in your classroom! Did you know that Oriental Trading has a website geared toward classroom resources?!?! Be sure to check out the Learn365 website to check out all of the amazing classroom resources Oriental Trading has to offer! I wanted to share two Paw Print Math ideas that you can use in your classroom using the paw print counters and the colorful counting cards. This Dog Coverall activity is super easy to prepare! 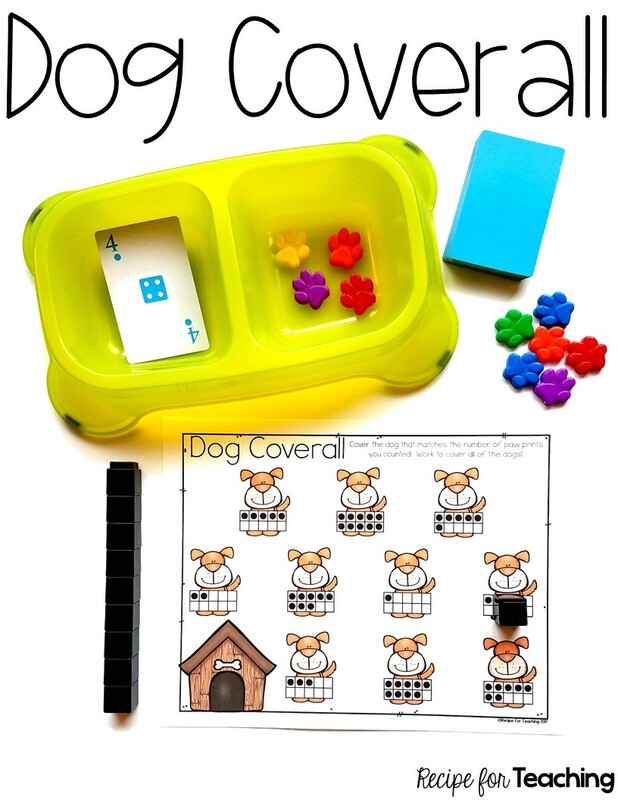 I printed the Dog Coverall board on white cardstock (found in the download below). I recommend laminating the board or putting it in a plastic sleeve for durability. I just grabbed my colorful counting cards and paw print counters. The Dollar Tree is where I found the dog dish. I chose to use Unifix cubes to cover the ten frames, but you could use any manipulative you choose. This activity can be done independently or with a partner. Students flip over a colorful counting card. I love these cards! The deck is in a plastic case and includes 50 cards with numbers 1-10. I love how it includes the numeral and the dot representation. They are great for students who may need to count the dots to identify the numeral on the card. 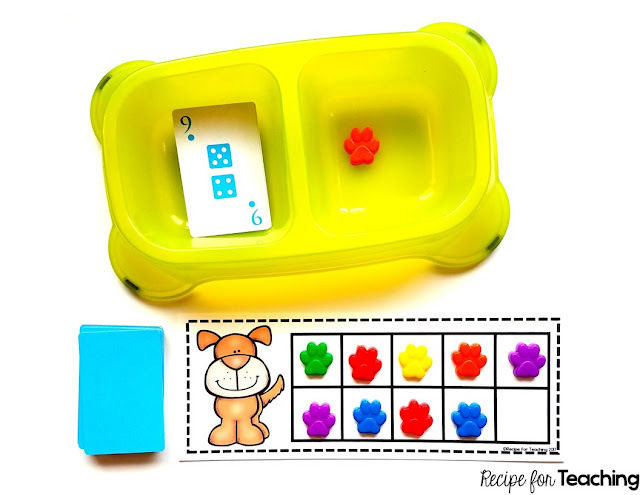 After students flip over a card, they count out that many paw print counters into the dog dish. 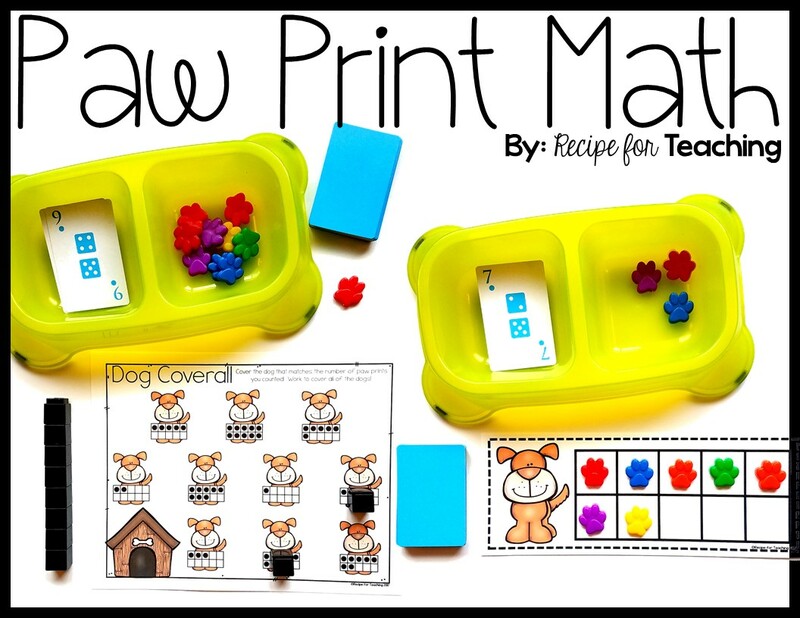 The paw print counters are so colorful and easy for little hands to count. After counting out the paw print counters, students then cover the dog with the ten frame that matches that amount. Students continue with the activity until all numbers on the board are covered. This activity is perfect for small math groups, independent work, partner work, and would be a great addition to a math station once your students are familiar with it. This Counting Paw Prints activity is also easy to prepare. I printed the dog ten frames (found in the download below) on white cardstock. There are two ten frames to a page so I used my paper cutter to cut them in half. I would also recommend laminating the ten frames for durability. 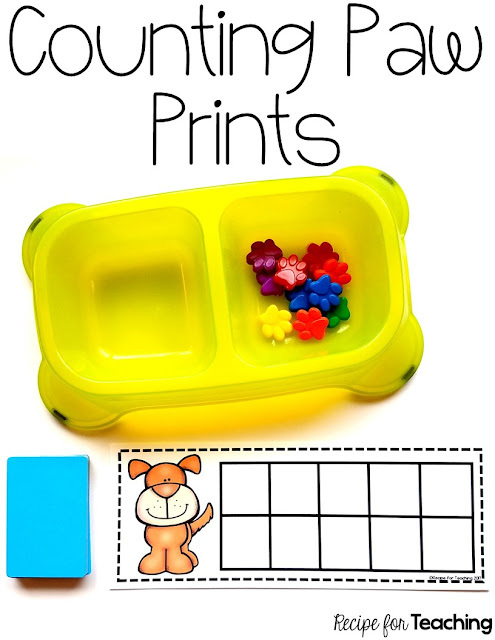 For this activity I also grabbed my paw print counters and colorful counting cards, as well as my Dollar Tree dog dish. This is also another activity that students can do independently or with a partner. For this activity, students flip over a colorful counting card. They read the number on the card and then count out that many paw print counters on their ten frame. In the example above, a counting card with the number 9 was turned over so the student would count out 9 paw print counters on the ten frame. In the example below, a counting card with the number 7 was turned over so the student would count out 7 paw print counters on the ten frame. This activity is also great for small math groups, independent work, partner work, or a math station. Ready for some Paw Print Math FUN?! Just click the image below to grab your FREE download! And be sure to check out the Learn365 website from Oriental Trading to get your own Paw Print Counters and Colorful Counting Cards! Some of the items in this post were sent to me free of charge from Oriental Trading Company. All ideas and opinions are 100% my own.